Here in New England we're enjoying the local bounty of fresh, native asparagus. 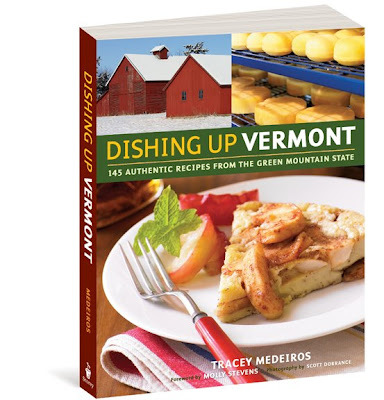 The recipe below is an elegant way to use some of the delicious spring yield and comes from the pages of Dishing Up Vermont, a collection of 145 recipes by innovative chefs, B&B owners, and farmers from across the Green Mountain State. Epicurious.com has called Dishing Up Vermont ". . . perfect for anyone who is — or aspires to be — a locavore." Bon appétit! Asparagus soup is a springtime delicacy that combines this early vegetable with the everyday goodness of Vermont milk and cream. 1. Trim asparagus; discard tough ends. Cut off the tips, and reserve stalks. Prepare an ice bath, and set aside. 2. Bring water to a boil in medium saucepan over medium-high heat. Add a pinch of salt to the water, and add asparagus tips. Cook for 2 minutes. With slotted spoon, transfer tips to ice bath until cool. Remove tips and set aside. 3. Meanwhile, dice asparagus stalks. Melt butter in medium saucepan over medium heat. Add onion, and sauté until soft and translucent, about 7 minutes. Add garlic, and cook for 2 minutes longer. Add hot chicken stock, asparagus stalks, sugar, nutmeg, salt, and pepper, and cook over medium heat until tender, about 8 minutes, stirring occasionally. Slowly whisk in milk, and cook for another 2 minutes. 4. Purée stalk mixture with handheld immersion blender, or working in batches, transfer stalk mixture to a blender and purée until smooth; return to saucepan. Cook over medium heat for another 5 minutes, then slowly whisk in half-and-half. Add asparagus tips, and continue to cook and stir until heated through. Adjust seasonings with lemon juice, sugar, salt, and pepper to taste; if soup is too thick, add more chicken stock or water. Ladle into bowls, and serve.